Over 1.2 trillion searches are conducted on Google each year, it has become the most common method, worldwide, for people to find information. By putting your company onto Google, you are making it easy for people to find you, and helping them to connect with you. In today's internet driven world, your customers are accustomed to having essential and fundamental information about a business instantly, at their fingertips. Information such as: What time are you open?, What services do you offer?, What are your customer reviews like? and essentially, Is this a company that I could do business with? All of these questions are important for customers to know, and by having this information ready for them, at their fingertips, it makes it easy for them to connect with you and for you to connect with them; building up the relationships that will make your company grow and flourish. 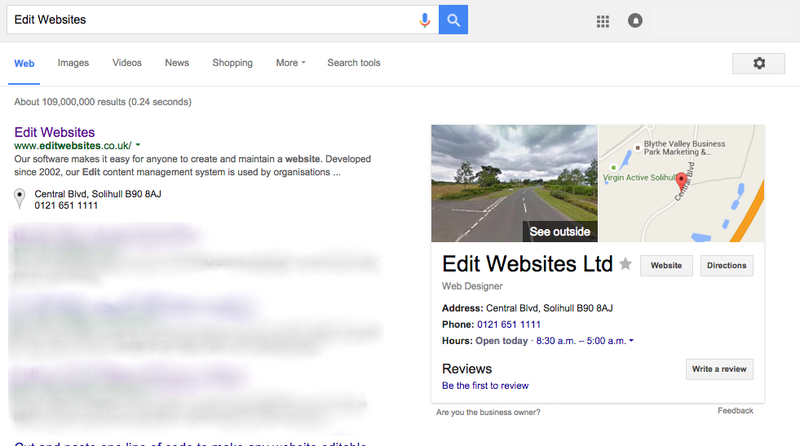 Google My Business is a great tool to use, it allows customers to have access to vital information such opening times and contact information, giving them a quick overview of your services and an easy way to connect with you directly from within their Google Search, as you can see in the example below. For new and potential customers, its a way for you to professionally present your company to them, allowing them to experience what it is like to be a customer with you. Having a Google My Business account will compliment your website perfectly, giving your business a public identity and presence on the world's leading internet search platform. The information that you provide on Google My Business can appear across the various Google platforms, such as Google Search, Google Maps and Google+, helping your business to connect to a much wider audience via the internet. To get started on Google My Business you can follow our simple guide, Getting Started on Google My Business. We have created this page to help you make the most of Google My Business, and we will be adding to it over time with more articles, so do make sure to sign up to our newsletter to receive our latest updates.